One night, Annie played a mind-reading game with me: "Guess what I want to eat tonight?" "Chicken is close, but not fried." 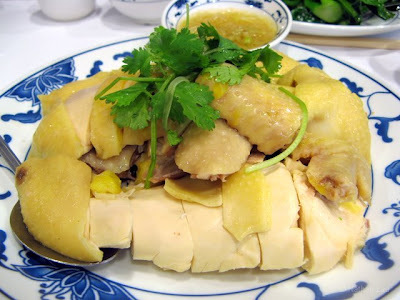 Annie ordered the steamed free-range chicken with ginger sauce. Like revenge, this is a dish best served cold. Unlike revenge, this is a dish best eaten over lots of white rice. That ginger sauce is killer! I ordered the steamed tofu with minced shrimp in soy sauce. 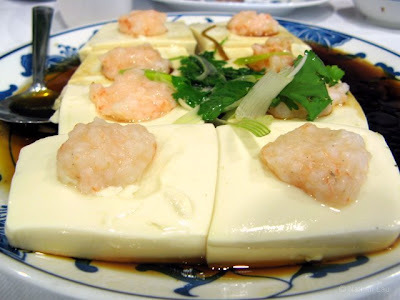 The dollop of minced shrimp isn't embedded in the tofu, so it comes off in one deliciously shrimpy bite. I assume the tofu is just there to cleanse the palate before the next bite of shrimp. We also ordered a plate of steamed oysters (those were some big, honkin' oysters) and a plate of kai lan. I like eating kai lan, but I don't like the way they're served - so oily that you can't get a grip with the plastic chopsticks. You either have to stab it with a fork or pinch the kai lan between the chopsticks with all your might, hoping it won't slip and fall into your bowl of soup on the way to your plate. 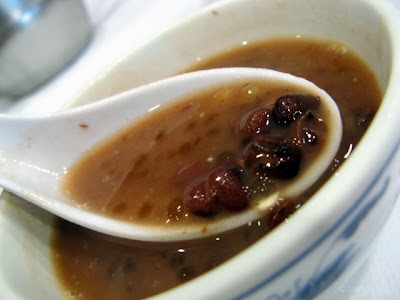 Dessert was some sweet red bean and tapioca soup. Be warned - there's a lot of sugar in this one. You may have to fight off the kids for the last spoonful.